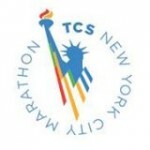 NEW YORK — In a battle that spanned five boroughs and took almost all of the course’s 26.2 miles, 32-year-old Mary Keitany of Kenya made her triumphant return to marathoning after a 2+ year absence, winning the 2014 TCS New York City Marathon in 2:25:07 over fellow Kenyan Jemima Sumgong (2:25:10). Keitany bided her time for 19 miles until she started to push the pace, eventually whittling a pack of seven down to just two at 22 miles. From there, Keitany and Sumgong ran the next four miles together in 5:10, 5:25, 5:10 and 5:09 before Sumgong finally broke just a few hundred meters from the finish line. Keitany’s three-second margin of victory was tied for the narrowest in the history of the women’s race in NYC (Paula Radcliffe beat Susan Chepkemei by the same margin in 2004). 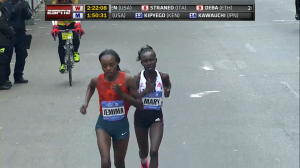 1) The wind was definitely a factor but that didn’t prevent a great performance from Mary Keitany. Overall, times were slower this year compared to 2013 (2:30:09 was 10th in ’13; 2:33:02 was 10th today), but the winning time was exactly the same: 2:25:07. That’s a credit to Mary Keitany, who is quite clearly back after missing over 21 months (from August 2012 to May 2014) when she took time off to have a baby. Keitany’s 65:39 half at the Great North Run on September 7 signaled that she was a threat to run fast in New York, and she put together a performance today that was probably worth 2:23 and change on a calm day (the course record is 2:22:31). Keitany learned from the mistake she made three years ago, when she went out in 1:07:56 for the first half. She was much more patient this time (hitting halfway in 1:13:42), waiting until 20 miles to start attacking. That also happened to be the point where the course changes direction, as mile 21 goes west and miles 22-25 go south (with a tailwind today). This allowed her to dramatically accelerate the pace in miles 22-26 as she had the wind at her back while she was making her move (her 5k from 35k to 40k was 16:14; the next-fastest 5k splits in the race were 16:57 and 17:15). Keitany ran her second half (traditionally the tougher part of the course) in 1:11:25, 2:17 faster than her first half. Jemima Sumgong also deserves credit as 2:25:10 is a terrific time given the conditions. Late in the race, it looked like Sumgong had broken Keitany (she had a lead of about five meters at 25.5 miles) but Keitany responded and eventually passed her. 2) What a debut from Sara Moreira. Portugal’s Moreira, who has a 70:08 HM pb, ran brave in her debut, leading for around eight miles (we can’t quantify exactly how much of the race she led, but she had the lead at miles 4, 5, 6, 7, 10, 13, 14 and 16). She couldn’t respond when Keitany and Sumgong really started pushing during mile 23, but she hung on well for third in 2:26:00. Moreira is extremely versatile — generally someone with her track pbs (4:07 1500/8:42 3k/ 14:54 5k/ 9:28 steeple) isn’t capable of finishing third in a major marathon. She’s qualified for Worlds in three different events (5000, 10,000, 3000 steeple) with a highest finish of 10th (5000, 2009). After her run today, it makes sense for Moreira to switch to the marathon full-time (she hasn’t broken 15:20 for 5000 since 2012); at 29, she should still have several years of high-quality marathoning ahead of her. 3) American Desiree Linden was initially upset after getting dropped, but her mood brightened significantly when she found out she was fifth. Linden’s plan going in was to get to 20 miles efficiently and then start racing, and though she couldn’t quite manage that (she fought her way back to the leaders after fading during miles 10 and 17 before getting dropped for good during mile 19), she was able to pick it up over the final miles and pick some people off, moving up from eighth at mile 19 to fifth by the finish. She accomplished that by running 17:47 for 5k from 35k to 40k after covering 30k to 35k in just 18:10 to pass Firehiwot Dado and Buzunesh Deba. 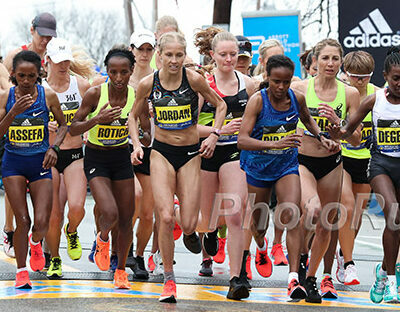 Linden battled Morocco’s Rkia El Moukim to the finish line and eventually passed her too, holding her off by just two seconds, 2:28:10 to 2:28:12 to finish fifth. Though that time was well off Linden’s pb (2:22:38), it was another solid performance for the 31-year-old, her fifth top-five finish in a major. Linden was the top American in NYC by a healthy margin (4:51) and if she stays healthy over the next year and a half, she’s going to be a strong favorite to make her second Olympic team in 2016. 4) Deena Kastor and Kara Goucher weren’t close to their pre-race goals. Kastor and Goucher entered the week with goals of 2:25 and 2:28, respectively, but both realized that those times probably weren’t going to happen given the strong winds. Still, both Kastor and Goucher elected to run with the lead pack in order to be shielded from the wind as much as possible. Goucher admitted that it was a risk that she and coaches Mark Wetmore and Heather Burroughs chose to take and that it didn’t end up working out. Goucher was very emotional in the post-race press conference, struggling to hold back tears on the podium as she admitted that this was the first marathon that she had truly bombed. She was 14th in 2:37:03, her slowest time by over four minutes and her lowest place ever (she was 11th at the 2012 Olympics; her previous lowest finish in a major was 6th in Boston last year). 5) It was best for the sport that Sumgong didn’t win. 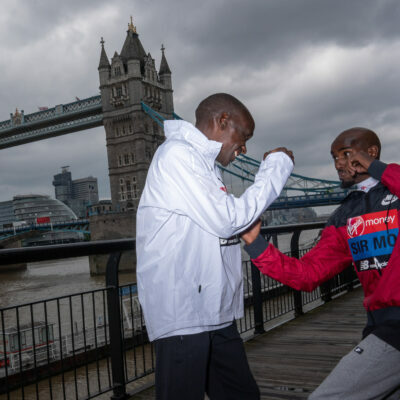 One scenario we were pondering as Sumgong and Keitany were racing to the finish line was what would happen if Sumgong won. Rita Jeptoo‘s positive A sample for EPO was one of the big stories this weekend in New York and Sumgong is the runner most closely-linked to Jeptoo as the two train together under coach Claudio Berardelli and Sumgong was initally banned from competition for two years in 2012 for testing positive for banned substance prednisolone before the ban was rescinded later that year. 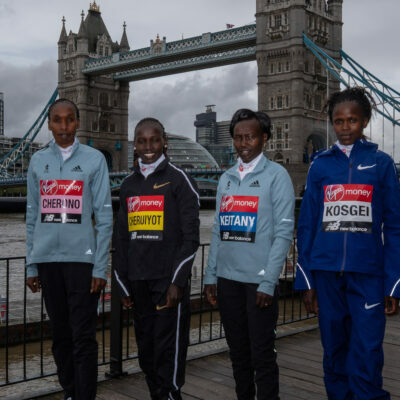 If Sumgong had won, with her history and close ties to Jeptoo, the focus would be on her and whether or not she was on drugs (it didn’t help that she seemed to play dumb when confronted with doping questions during pre-race media availability). 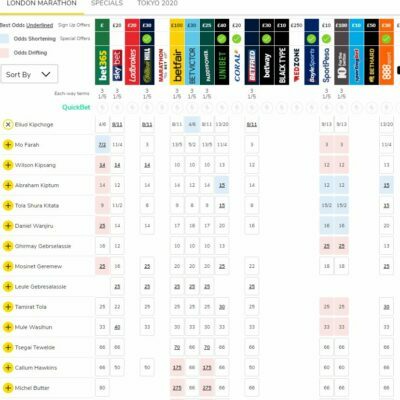 After a race like this, the focus should be on the tremendous performances by the champions, not speculation about whether an athlete is on drugs or not. 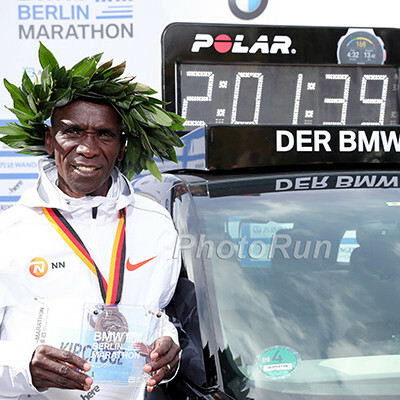 By preventing Sumgong from winning, Keitany insured that the focus remained on her performance. Mile 6: 5:34 (33:48) 35:01 at 10k. 17:30 second 5k. Mile 9: 5:29 (50:32) 52:18 at 15k. 17:17 third 5k. Mile 12: 5:29 (1:07:15) 1:09:45 at 20k. 17:27 fourth 5k. Mile 15: 5:42 (1:24:22) 1:27:36 at 25 k. 17:51 fifth 5k. Mile 18: 5:24 (1:41:03) 1:44:33 at 30k. 16:57 sixth 5k. Mile 21: 5:35 (1:57:40) 2:01:48 at 35k. 17:15 seventh 5k. Mile 24: 5:25 (2:13:37) 2:18:00 at 40k. 16:12 eighth 5k.